DERRY has pledged to build on the city's success as a rising food tourism hotspot after narrowly missing out to the Boyne Valley as Ireland’s top Foodie Destination 2016. 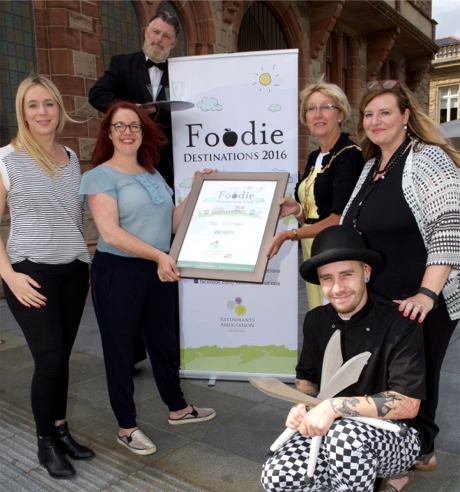 For the second year in a row, Derry was announced as Foodie Destination runner-up after the council-led bid was a top ten finalist in this year’s search by the Restaurants Association of Ireland. Derry was the only Northern Ireland contender for the hotly-pursued award with The Burren in Co Clare taking third followed by Cong, Co Mayo and Sligo. Derry Mayor Alderman Hilary McClintock pictured with Food Destination 2016 judges Dee Laffan and Aoife Carrigy. Also included, on right, is Mary Blake and street entertainers Pierre and Jan du Toit. Mayor of Derry Hilary McClintock said the result further raised the profile of the city’s “unstoppable” food tourism offer. “Food tourism represents one third of all visitor spend and, with this being Northern Ireland Year of Food and Drink, we have taken our Foodie Destination offering to an even higher level. For the second successive year, our campaign has been an excellent opportunity to showcase the city’s award-winning local food provenance." Derry Tourism Development Manager Mary Blake who co-ordinated Derry's bid, said: “We were delighted to be one of the top ten finalists from more than 30 applications. We poured a lot of information into our application, turned up the heat with a sizzling suppliers’ showcase, and then stirred up a robust online campaign to get our foodies voting for Derry."